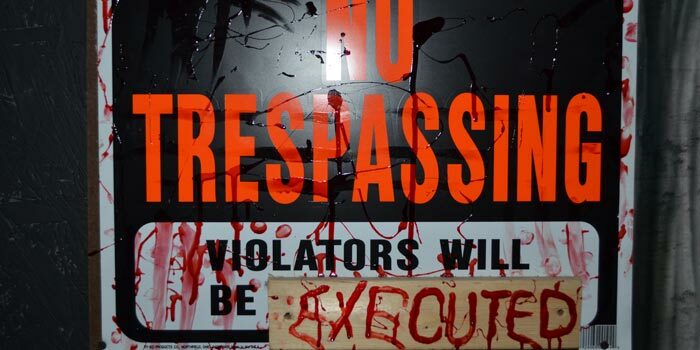 A dire warning greets guests when they first enter the haunted house. WARSAW — Unwary guests are invited to the Kosciusko County Fairgrounds in October, where they will experience sights, sounds and even smells that will send a chill down their spine. Greeting “victims” at the door will be the Soul Taker himself, ushering them into his lair. Once inside, there is no turning back as guests feel their way through dizzying twists and turns, never quite knowing what lurks around the corner. Even seasoned Soul Taker’s Acres visitors will get a thrill out of this year’s new features. While there may be no turning back, there will be some means of escape, as exit doors will be available at intervals for those who cannot handle another moment. However, coordinators warn that Soul Taker’s Acres may not be appropriate for some, especially those with heart conditions and extreme fear of spiders and snakes. The particularly young may also find Soul Taker’s Acres a bit too scary. There are also strobe light effects throughout. New this year is Zombies Alive, where visitors will have a chance to test their aim by pelting costumed zombies with paintballs, all from the safety of a moving trolley. Admission to Zombies Alive is separate from admission to Soul Taker’s Acres. All proceeds raised from both frightful attractions, as well as souveniere sales will go toward the ADA fund, established after a recent lawsuit. The fund aims to make the fairground accessible for those who are wheelchair bound or have difficultly walking. T-shirts and souvenirs will be for sale and concessions, including elephant ears, will be available. Kids and adults can also roast marshmallows over an open fire. It takes many volunteers to make Soul Taker’s Acres and Zombies Alive possible. These include members of the Kosciusko County fair board; Kosciusko County 4-H Horse and Pony Club members and their parents, friends and family; and a number of people from the community. While one typically only sees the ghosts and ghouls, there are many more working behind the scenes. Fair board members, Sheal Dirck, Tony Zimmerman and Randy Shepherd are the masterminds behind many of the features. Dirck noted he attends Haunt World each year for new ideas and inspiration. Also crucial to the program’s success is Mike Braden, who puts his airbrushing talents to work, creating many of the frightening faces guests will encounter. It is not too late to sign up to volunteer. Anyone interested can call the fair board at (574) 269-1823. Volunteers need only commit to what time they have. That can mean one night or every night, depending on their availability. Hours are 8-11 p.m. Fridays and 8 p.m. to midnight Saturdays, Oct. 2-31. Those not willing to pay with their lives can pay $10 to walk through Soul Taker’s Acres or $15 for a Fast Pass to the front of the line. Zombies Alive is $8 for the first 100 paintballs and $5 for an additional 100. Those who would like to learn more about Soul Taker’s Acres can visit the website or check them out on Facebook. 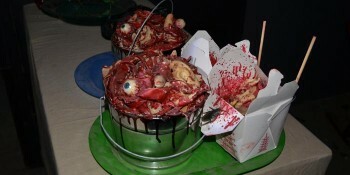 Zombies Alive also has its own Facebook page. Air-brushed faces make many of the ghouls seem more realistic this year. It is difficult to tell what is real and what is not. A spook takes a break from haunting. Merchandise proceeds will go toward the fairgrounds ADA fund.